Is there anything better than a steaming pile of pasta topped with freshly grated cheese? Cheese lovers everywhere recognize that this is a tantalizing treat for the taste buds. Freshly grated cheese turns a pile of noodles into a gourmet meal. But does it really make a difference if that cheese if freshly grated? I believe that there is a huge difference between the taste of freshly grated cheese and store-bought pre-grated cheese. Grating cheese by hand with a metal or plastic grater works but it takes a lot of effort to grate even a small amount of cheese. Plus, there’s always the risk of accidentally grating your fingers along with the cheese. The solution? An electric cheese grater. An Electric cheese grater let you safely grate as much cheese as you want and they do it much quicker than is possible with a hand grater. After doing a lot of research and eating a lot of cheese, I’ve created this list of the best electric cheese graters. Each one of these cheese graters has something to offer and hopefully, this list will help you find the right one for you. 8.1 Can I Grate Cheese without a grater? 8.2 Can You Grate Cheese in advance? 8.3 What type of cheese should I grate for pasta? 8.4 Can I use a food processor instead of an electric grater? 8.5 Can I use a blender instead of an electric grater? 8.6 Is there a trick to grating softer cheeses? This is a beautiful piece of professional-grade equipment. It’s built to last, with a durable nickel-plated finish, a 2.75 qt stainless steel bowl, and a heavy-duty cast aluminum body. The grater is easy to clean as the hopper slides off easily and can be cleaned with soap and water or put in the dishwasher. Grandma Ann’s versatile machine will let you grate a large amount of cheese in minutes. It works extremely well for hard cheeses like parmesan and gruyere and can handle softer cheese like mozzarella. It is also an excellent machine for grating hard vegetables like potatoes and coconuts. Two blades are included, the regular grating blade and a roller blade for shredding. You can even use it to grate soap. The 1/2-horsepower motor gives you more than enough power. This American-made electric cheese grater comes with a 1-year warranty. If you’re a sucker for a good story, you’ll enjoy knowing that Grandma Ann was a real person, famous for her kugelis, a potato dish that required some serious grating. Ann’s grandchildren grew up helping Grandma in the kitchen and they designed this grater to honor her legacy and to capture “hand-grated goodness” in a high-powered electric version. Grandma Ann’s Electric Grater is a versatile, commercial-grade piece of equipment that works well, is easy to clean, and looks really nice on a countertop. If you want a tool that slices and shreds cheese with ease, this is one to look at. Unfortunately, it will not do a fine grate so if you’re looking for powdery parmesan, this is not the tool for you. This white tool isn’t the best-looking electric cheese grater on the market, but it’s very affordable and performs extremely well. 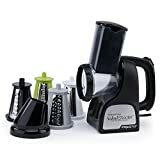 If you want a versatile tool that shreds cheese but will also work well for slicing veggies or chopping nuts, this Presto SaladShooter should meet your needs. It uses four cones, one for thin slices, one for thick slices, one for ripple cuts, and one for shreds. One really nice feature of this is the handle, making it easy to point where you want the shredded cheese to go. This makes it easy to fill a bowl of shredded cheese or to shred cheese right on top of a plate of pasta. Cleanup is easy, as all the removable parts are dishwasher safe. The Presto 02970 Professional SaladShooter is an affordable and versatile tool for shredding and slicing cheese but it is unable to finely grate cheese. This is a durable and hardy cheese grating machine capable of handling up to 40 pounds of hard cheeses or dried bread products per hour. It runs at 100 watts and on 110V. Powerfully designed with professional use in mind, this hefty grater delivers maximum performance without a hitch. It also comes with a 1-year warranty so you’ll have peace of mind knowing that if this machine breaks, you won’t be out the money. Ideal for the grating of harder cheeses, dried pieces of bread, and biscuits, it utilizes a permanent magnet motor for problem-free operation. While this machine is perfect for hard cheeses, it doesn’t work well with very moist cheese. You won’t be able to do much with mozzarella or other standard cheeses, for instance. For personal use or for slicing, this is a great option as well. Keep in mind that there are a few mechanical particularities associated with this machine. For example, if you press too hard when grating cheeses, the plastic guides on the side tend to slip and may crack. You have to use a gentle yet firm touch that takes a bit of getting used to. Additionally, the on/off switch hs toggle operation and must be held down as you grate. This can be a bit of a hassle and takes some getting used to as well. Finally, this machine is difficult to clean which is a definite disadvantage. For the price, we feel that this machine should come with better thought out user features overall. Sturdy – This is a durable and hardy machine that can be used for years on end with few issues. Powerful – With a permanent magnetic motor, this machine offers users plenty of power for grating hard cheese and dried bread. Simple to use – This grater is easy to operate and understand. Hard to clean – You may have issues taking this grater apart when it comes time to clean it. Not for soft cheeses – If you need to grate soft or moist cheeses, this is not a very good option. Expensive – This isn’t by any means a cheap option, this one is meant for restaurants and food professionals. Verdict: If you are in need of a powerful and sturdily built cheese grater for hard cheeses or dried bread, this is a fantastic option worth considering. It has a powerful permanent magnet motor and can stand up to daily wear and tear. On the downside, the toggle on/off switch must be held down during operation which can get annoying. additionally, it’s not the best option for soft or moist cheeses. For the price, we would have liked to see better overall user features. Still, if you need to grate a lot of hard cheeses or dried bread, this is a solid machine. For professionals who need a seriously powerful and reliable grating tool, the Omcan Italian Commercial Electric Cheese & Bread Grater is a fantastic option. This machine allows for the effortless grating of hard cheeses and bread products. It has been designed to be suitable for a multitude of other applications as well. This particular model sports a cast iron grating drum and a stainless steel hopper with a matching stainless steel grating. Stainless steel is durable and rust-resistant so you’ll get more use with less hassle. This machine and all of its components have been made in Italy. The specs of this machine are also pretty impressive. It has 110V of horsepower, and also comes with a 1-year manufacturers warranty. The CSA electrical certification and voluntary NSF certification help to ensure the peace of mind of users, which is good, considering that this machine comes with a pretty high price tag. Italian stainless steel has long been praised for its exceptional craftsmanship and longevity. This model is ideal for anyone who needs a fast and easy grating experience time and time again. Another bonus is that this model is fairly easy to clean and service. As far as disadvantages go, this grater is downright expensive if you plan on utilizing it at home. It’s not for novice users and will only pay for itself if used professionally and continuously. That being said, if you need a grater for professional use, this is actually one of the less expensive options out there. It all really depends on how you plan to use it. Fine craftsmanship – The Italian design and components of this machine make it a high-end and professional cheese grating option. Easy to clean – The components and parts of this machine are easy to clean and service. Powerful – This grater has 110V of horsepower making it ideal for grating medium and hard cheeses and hard pieces of bread. Quality materials – This grater utilizes both stainless steel and cast iron in its material construction. Not ideal for home use – For the price, this machine is probably better suited for professional or heavy-duty use. Verdict: For professionals who need an inexpensive cheese grater that can get the job done when used industrially, this is a fantastic machine that can get the job done well. For users who need a sturdy and powerful grater for at-home use, this may be a bit on the expensive side. It’s an Italian made machine that features stainless steel and cast iron construction as well as a powerful 110V horsepower motor. This may be a bit excessive for most standard cooking and grating applications. However, if you need something for a small restaurant or industrial cooking, this could be a great choice. It’s sturdy, well-made, and easy to clean and service. Like the Presto 02970 Professional SaladShooter, this is a good tool for slicing or shredding cheese but not for finely grating cheese. This is essentially the same as the professional model, but it doesn’t have as many cones. There are only two cones included, one for slicing and one for shredding. Like the 02970, it has a handle for convenient point-and-shoot use. The other major difference from the pro model is the capacity. It’s not a huge difference, but the cones do have a smaller capacity which cuts down a bit on the grating speed. This is easy to put together, easy to use, and easy to clean. 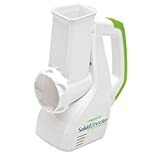 The Presto 02910 Salad Shooter Electric Slicer/Shredder offers a great price and decent performance for slicing and shredding cheese. Most cheese graters look essentially the same, but this grater from Cole & Mason stands out from the crowd. It looks almost like a piece of modern art, an elegant and minimal sculpture. Unlike most of the other graters, this one isn’t versatile. Grating cheese is all it does, though you do have a choice of two blades with different grating styles. This cheese mill is powered by 6 AAA batteries and unfortunately, it doesn’t take long to go through these batteries. For this reason, it’s probably not a good option for people who need to grate cheese regularly unless they want to buy a ton of batteries. Some users have reported problems with the performance of this grater but it can grate quite well, at least in small quantities. The grating base can be used as an attractive storage container for the grated cheese and even comes with a nice lid. There is also a nice tray or base for the cheese mill to rest on. The Cole & Mason Electric Cheese Mill is a unique and beautiful tool but it lacks power and isn’t a good choice for heavy users. A multi-functional and extremely versatile machine that would be a great addition to just about anyone’s kitchen, this electric shredder and slicer combination has many impressive functions. It can be used to slice vegetables, fruits, and shred cheeses quickly and effectively. 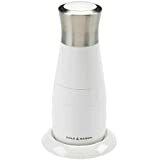 Use it to make soups, salads, garnishes, and more. It’s very easy to use and safe as well. You won’t have to worry about accidentally having a mishap in the kitchen with this user-friendly model. The changeable cones can be switched out so you can slice, dice, and shred with ease. You’ll also get even and attractive slices which bring a whole new element into your home kitchen. The motor base of this machine wipes clean easily and all of the other components are dishwasher safe. This is a great choice for anyone who cooks for friends and family often. Home chefs will appreciate the simple and smart design. For the price, you really can’t go wrong. As far as specifications go, this slicer and shredder has a 150W motor and can be used frequently in any home. Consider that this isn’t an industrial grating tool. It has been designed to be used by everyday people who wish to step up their game in the kitchen. It would not be well-suited for restaurants or for daily industrial use. However, as a kitchen tool, it’s a fantastic machine that can simplify and expedite slicing, grating, shredding, and more. Versatile – You can use this little machine to slice, dice, shred, and grate cheeses, vegetables, bread, fruit, and more. Simple to use – The user-friendly features and design of this machine make it a great option for professionals and amateurs alike. Easy to clean – All parts of this machine can be removed from the motor and washed in a dishwasher. Great value – For at home use, this product comes at a very fair price and can be used for a wide range of cooking applications. Not for professionals – While this machine claims to be for professional users, it is referring to experienced home chefs and should not be used for industrial or large restaurant cooking. Verdict: Are you a home chef looking to step up your slicing game? Do you frequently chop, dice, and cut up cheese, but also fruits and vegetables for salads and garnishes? Do you need to shred cheese quickly and effectively? If you have answered yes to any of these questions, the Korie Automatic Salad Maker Machine and Shredder may be worth considering. It’s a versatile slicing tool that can make the lives of home culinary artists much easier. While it isn’t designed to be used as an industrial tool in a restaurant, it’s a great option for anyone who wants to quickly and easily slice, cut, or shred food with less effort. It also comes at a very fair price. Can I Grate Cheese without a grater? A cheese grater allows you to grate cheese quickly and create pieces of a uniform size, but it’s possible to grate cheese without a grater. You can use a knife and a cutting board to finely mince the cheese. For hard cheeses like parmesan, you can take two chunks of cheese and rub them together. This will crumble the cheese in a way that is fairly close to a grating. You can also use another countertop appliance, like a food processor, to grate cheese. Many food processors have a special blade for shredding cheese. It’s also possible to grate cheese in a blender, especially with a Blendtec or a Vitamix. Soft cheeses won’t do very well in a blender but hard cheeses will probably be okay. Non-electric cheese graters work extremely well for grating cheese. You can find both metal and plastic hand cheese graters. The only disadvantage it takes much longer to grate even a small amount of cheese. It also takes quite a bit of effort and it can really feel like a workout. While there are all kinds of different ways to grate cheese, an electric grater provides the best results in the shortest amount of time. Can You Grate Cheese in advance? Cheese often tastes best shortly after it has been grated or shredded. However, you can grate cheese in advance and store it. Shredded or grated cheese will typically store well in the refrigerator for a week or two. You might want to add just a bit of cornstarch to the cheese to prevent it from clumping and sticking together. It’s also possible to store grated or shredded cheese in the freezer. It will usually be good for a few months, but you’ll risk freezer burn if it goes any longer than that. What type of cheese should I grate for pasta? The classic cheese to grate for pasta is Parmigiano Reggiano (often just called parmesan) but that’s not your only option. Other cheeses that taste wonderful when grated onto pasta are Pecorino Romano and Grana Padano. You also don’t have to stick to just one cheese at a time. A mixture of parmesan and romano cheeses are perfect for pasta. The best cheeses for grating on pasta are hard, salty, and intensely flavored. Other softer and creamier cheeses have their place with pasta as well, especially when incorporated into a sauce. Can I use a food processor instead of an electric grater? As long as your food processor has a shredding blade, it will work for grating cheese. You will generally only be able to get a thicker shred as opposed to a finer grate but a food processor can definitely help prepare cheese. Some food processors might have a blade that lets you get a finer grate. Can I use a blender instead of an electric grater? Some blenders will work to grate cheese. These are mostly the more high-end blenders like the Blendtec and the Vitamix. A blender will only work for the harder cheeses, as softer cheeses will have a tendency to clump together and clog up the blades. In general, a blender is not the ideal tool for grating cheese. Is there a trick to grating softer cheeses? Soft cheese does have a tendency to get stuck in a cheese grater and to clump together. The best way to prevent this is to make sure the cheese is quite cold before trying to grate it. Putting the cheese in the freezer for 20 minutes or so will help by temporarily firming the cheese up a bit. This trick will help you grate the cheese successfully without any clumping or clogging of your electric grater. It’s also a good idea to use a coarser blade if available on your cheese grater. A fine grate is perfect for parmesan but won’t work nearly as well for mozzarella or cheddar. By this point, you’re probably hungry for some cheese! If you’re in the market for a cheese grater, I hope this list helped you narrow down your options. Have you tried any of these electric cheese graters? Is a fantastic grater missing from this list? Please share in the comments. While you’re there, feel free to share a favorite cheese recipe so we can all put our cheese graters to good use. What cheese grater would you recommend for commercial use? For commercial use, you need a grater that will be durable and can withstand heavy, regular use. You will also probably want your grater to be versatile, sanitary, and easy to clean. The Commercial Italian Electric Cheese & Bread Grater from FMA Omcan Food Machinery (click here to see on Amazon) is a great choice. It’s very durable, with stainless steel and cast iron construction. The design is suited to fast and easy cleanup, a definite plus in any commercial kitchen. This Italian-made grater is a dream for hard cheeses like parmesan. It also works well for grating bread for breadcrumbs. For most uses, you’ll find that the 0.5 HP belt-driven motor offers enough power. However, this grater is probably best for small to medium applications. If you need a large output commercial use cheese grater, I recommend this Alfa International’s Electric 1.5 HP Hard Cheese Grater. This is another Italian-made grater with durable and sturdy construction. The bowl and grater drum are stainless steel, making for easy cleanup and sanitary conditions. What makes this grater stand out is its power. It has a gear-driven 1.5 HP motor and offers plenty of power for grating a lot of cheese. The motor is also durable so it will continue offering consistent power output for a very long time. You will have plenty of power for grating really hard cheeses and it will also make quick work of grating hard vegetables. This grater has a number of safety features, a good idea for a fast-paced commercial kitchen.